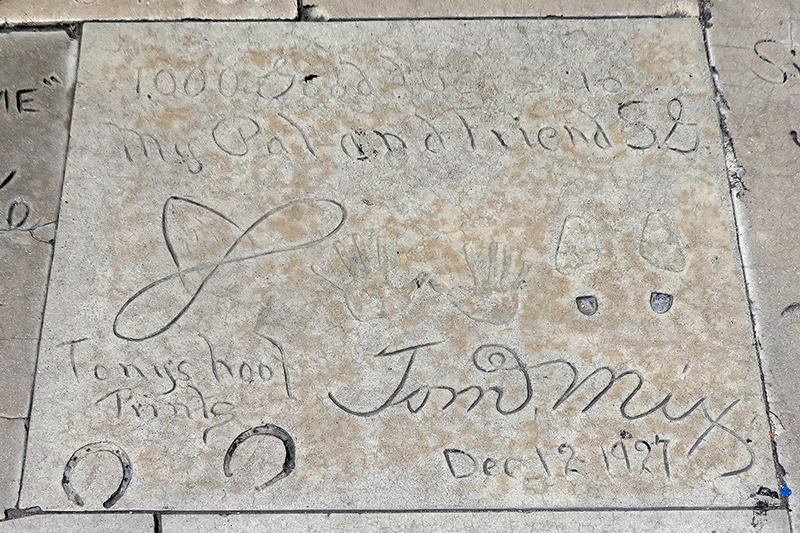 April 26, 2015 — Handprints, footprints and hoof prints by Tom Mix and his Wonderhorse Tony at Sid Grauman's Chinese Theatre in Hollywood, December 12, 1927. Inscription by Mix reads: "1,000 Good lucks to My Pal and Friend S.G. / [Hat, handprints, boot prints] / Tony's hoof Prints  / Tom Mix / Dec. 12, 1927." LW2786: 19200 dpi jpeg from digital image by Leon Worden.